The File / Folder category features multiple Actions that can perform a variety of automatic operations with files and folders. Automation Workshop Free Edition takes care of routine file operations such as file copying, moving, renaming and deletion, as well as setting time and attributes, reading and writing contents. Whatever you normally try to with your files, Automation Workshop can do it easy and completely for free. Since all data on computer systems are stored in files that are themselves located in folders, it is no surprise that automation often involves operations with these files and folders. Automation Workshop Free Edition handles file and folder operations with ease. Without using any scripts You can choose the necessary operations from the list of relevant Actions and configure them precisely. File and folder Actions support Unicode in file names, allow advanced filtering based on file and folder name, extension, age and attributes, and permit detailed logging about performed operations. All file & folder Actions work both with local and network drives. Not only each Action features flexible options for specifying automated file operations, but also options that allow to join multiple file and folder Actions together. In order to perform complex operations, Actions can take parameters from preceding Triggers and Actions. For example, file and folder Actions can be activated when preceding File / Folder Watcher detects changes in files or folders. Or just copied files can be added as email attachments by the following Send Email Action. Close integration of Trigger and Actions allows to use them as simple yet efficient building blocks to design really intelligent Tasks. Copy file can automatically copy files from one folder to another. Multiple date, time, name and attributes based filter allow precise control over what is copied and what is not. Move file automatically moves files from one folder to another. The files are copied to the destination folder and then erased from the source folder. Rename file performs automatic file renaming. Advanced filters to include and exclude certain files to rename exactly the necessary files. Delete file removes unnecessary files from local or network folder. Automatically delete files according to specified file mask after particular event or on schedule. Read from file retrieves file contents and makes them available for following Actions. File contents can be used either for specifying data or runtime parameters for other Actions. Write to file writes specified or acquired data into a file. Store all the important data collected or generated during the Task execution into a file that can easily be accessed later at will. List files retrieves a list of files in specified folder. The Action provides complete control over what files are included and excluded (based on their name, extension, size, and attributes). It also provides options to place files in specific order sorted by file name, extension, path, size as well as creation, modification and last access date. Moreover, it allows adding custom prefixes and suffixes to each line, including folders, and more. Compute file checksum calculates file's cryptographic hash checksum in most popular formats like SHA-512, CRC32, MD5 and others. Get file information retrieves essential information about files such as file size, file attributes (in various formats) and file owner information. Get date and time reads file creation, modification and last access date. Set date and time provides options for changing file and folder creation, modification, last changed and last access dates and times. Advanced filters allow selecting necessary files and folders based on their name, type, attributes, as well as current dates and times. Set attributes allows to change file and folder attributes automatically. The Action features options that allow choosing files for attribute change based on their name, extension, age and current attributes. Split file path divides provided path in its key components such as drive letter, folders, file name and file extension and makes it readily available via Variable Wizard. 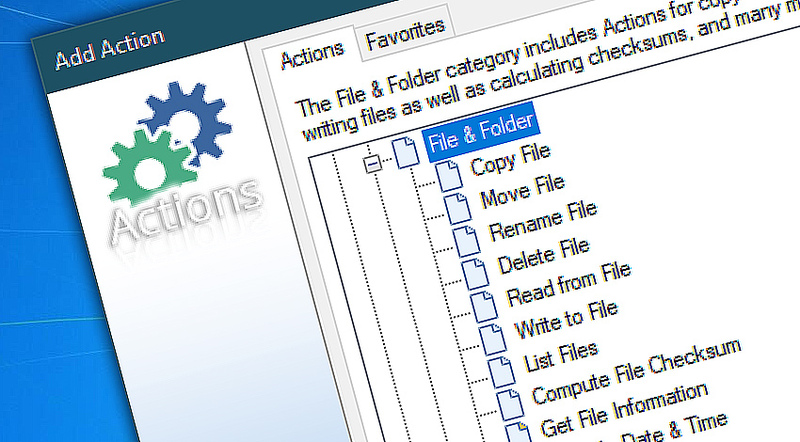 Folder Actions provide automated options for creating, duplicating, renaming, deleting and clearing folders. Copy file · automatically copy files from one folder to another. Move file · automatically move files from one folder to another. Rename file · automatically rename files or groups of files. Delete file · automatically delete files that are no longer necessary. Read from file · use data from file as runtime parameters of other Actions. Write to file · store data into files for convenient later use. List files · create a list of files in folder to use it in various ways. Compute file checksum · calculate file's cryptographic hash to ensure its integrity. Get file information · retrieve file size, attributes and owner. Get date and time · read file creation, modification and last access date and time. Set date and time · change creation, modification, last changed and last accessed dates. Set attributes · change file and folder attributes automatically. Split file path · divide file path into parts. Automation Workshop is an awesome piece of software. It will save us thousands of man hours this year alone! —Chuck W.